One year ago, Sweet Metel Moments made its debut in the blog world. I will forever be grateful to my husband who pushed me into starting this blog. I thought it would be a great place to share some stories about my family, practice my photography, share sweet treat recipes, and showcase some of my party creations. It has turned out to be such a wonderful adventure - from the creation of my Etsy Shop, writing for My Baby Clothes Boutique, being published on FaveCrafts (will post more on that later), and more! I want to say thank you to the amazing support I've received from my wonderful family and friends who not only read my blog, but share my blog with others, leave comments, send a positive email my way, or just continue to give me words of encouragement. 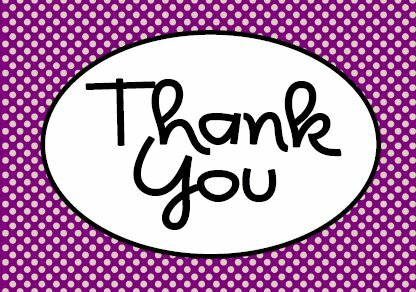 I would also like to say thank you to my new bloggy friends that I've met through this journey, and to the wonderful bloggers that feature my work on their site and help bring thousands of readers here (like Kara's Party Ideas, Pizzazzerie, Tip Junkie, I Share Printables to name a few!). And a huge thank you to my wonderful Etsy customers! Your business means the world to me! And knowing that my designs are being used at such special celebrations brings me so much joy and honor. I wish I could be a fly on the wall to see all of those fun celebrations take place. 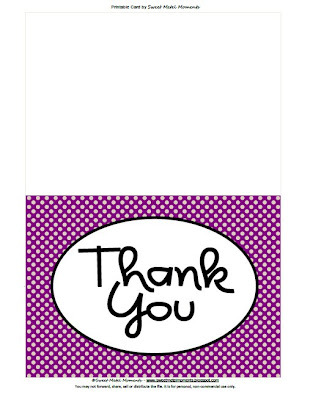 To show my gratitude, I created a 5x7 Thank You Card printable that you can use to send someone a special note of thanks. Hope you like it! I am so excited to see what lies ahead in the future. I leave all things in the hands of God and only He knows what is to come. Thank you Lord for all of your blessings! And thanks to my blog readers for joining me in this adventure. Blessings for many more blogging years ahead!